The Ortlieb Rack Pack is a classic piece of luggage. 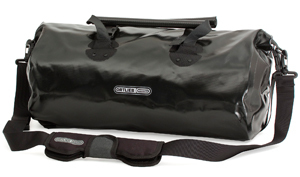 It’s a universal holdall bag that has proved its versatility on every continent. The full-width roll closure allows fast access and keeps water and dust outside. Using the Rack Pack in combination with a set of panniers is a great way to expand your gear carrying capacity. The Ortlieb Rack Pack can be placed on top of your rear rack loaded with side panniers. It can be attached to the rack using its side buckles, which can be threaded through the pannier handles. You can use an additional strap to attach the Rack Pack over the top of your setup if necessary. Amanda has safety yellow, and Andrew has stealth black. Great addition. This allows you to carry just a little bit more than the standard four panniers do. I would recommend getting the large instead of the medium that we have just so you’re not always trying to carefully pack the bag to fit everything. We haven’t upgraded to the next size up simply because I just fear we’ll fit it and end up carrying more.